The island of Lagosta (now officially called "Lastovo" in Croatian) was almost half inhabited by Italians when it belonged to the Kingdom of Italy between the two world wars, but now does not even have a single inhabitant Italian. In simple words, Lagosta is a perfect example of how can be done a complete ethnic cleansing. But what really shocks is that currently this "ethnic cleansing" -to use a term dear to the infamous "Tito supporter" named Vase Cubrilovic ( http://brunodam.blog.kataweb.it/2008/06/20/vaso-cubrilovic-la-mente-creatrice-della-pulizia-etnica-iugoslava/ )- does not raise officially by the government Italian any complaint and it is not remembered by virtually anybody (except the small organizations of the exiles from Istria-Fiume-Dalmatia and those few of the Dalmatian Italians). And this also applies to Lissa (now called "Vis"), another Dalmatian island where -during the years it belonged to the napoleonic Kingdom of Italy- almost all the inhabitants spoke in the Italian dialect called "Veneto da mar", but in our days no one -and I repeat no one- speaks it. I will not go into detail on how this ethnic cleansing has taken place across the central-southern Dalmatian island, since the awake and development of the Slav nationalism in the nineteenth century. 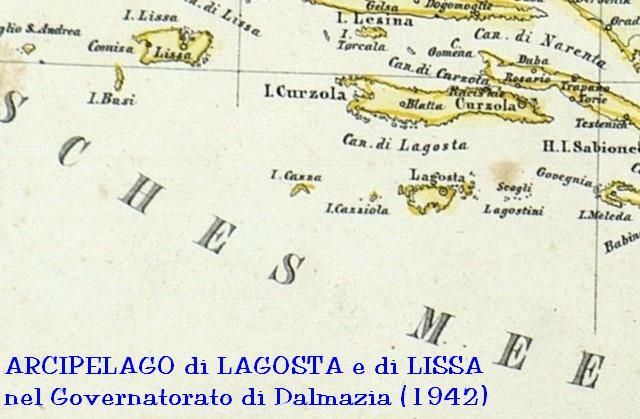 But I want to synthesize and center my analysis on Lagosta, since it is the only dalmatian island that officially belonged to Italy south of Zara (a formerly Italian city now called Zadar). Lagosta is part of the Southern Dalmatian islands archipelago, lined -together with the islands of Cazza, Cazziol and the Lagostini rocks- to the south of the island of Curzola (called now Korcula in croatian), from which it is separated by the Channel of Lagosta. The island, with its small surrounding islands, has about 56 km2 and a population of only 792 inhabitants according to the 2011 Croatian census. The most important settlement is the town of Lagosta on the northern coast of the island, with its Gothic-Renaissance church of SS. Cosma and Damiano. Other settlements include the villages of San Pietro, Lucizza, Porto Chiave, Pasadur and the village of Porto Rosso on the southern coast. The history of Lagosta was closely related since the Middle Ages with the history of the Republic of Venice and that of Ragusa. The population was originally composed only of Dalmatian Italians, but before the year 900 AD some Croats began to arrive, and they became the majority at the time of the Turkish invasions. The destruction, around 1000 AD, by the Venetian Doge Pietro Orseolo II of the oldest settlement on the island that was in the harbor of St. Peter (now called Uble) and the imposition, according to tradition, to the "Lagostani" to rebuild it in an area of ​​the island where they could not see the sea (especially because so they could not be attacked by the Slav pirates called "Narentani") is the cause of the location of the town of Lagosta in a valley far from the sea. At the beginning of the fifteenth century, when the Ottoman Turks started to invade the northwestern Balkans, began to move into the island groups of "Vlasi", or neolatin Wallachians who were Slavicized and were also called "Morlachs" originating from Herzegovina according to the historian Ciro Truhelka ( https://doc-0c-94-docsviewer.googleuserc…(1941)-10+dio.pdf&user=AGZ5hq8BgbJY1gwaOYx83cPOdNw6 ). These Vlasi -according to historians like Mirko Vego -eventually became the majority of the Slavic population in Lastovo in the seventeenth century, while in turn the neo-Latin population of the island was reduced to a small minority especially because of the birth rate lower than the Slavs' one. But the fact that the Vlasi were so many made ​​the Slavic dialect of the island full of words of Latin origin. And it has led some, such as Tomasin, to consider that the current Croatian population of Lagosta is of mainly neo-Latin origins, because of these Morlachs/Vlasi with Mediterranean looking hair and dark eyes. 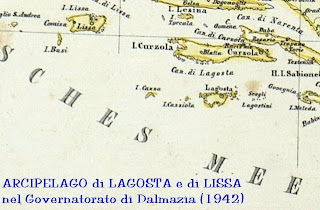 Together with the island of Meleda (now Mljet) and Sabbioncello peninsula, Lagosta belonged to the Republic of Ragusa until 1807, by which depended even after all Dalmatia passed to Austria (1815). Lagosta was part of the Napoleonic Kingdom of Italy between 1807 and 1810, having the Italian as the official language and the language at school. Unlike all the other islands and locations of southern Dalmatia, with the Treaty of Rapallo at the end of the First World War, Lagosta was aggregated to Italy (inside the "Province of Zara"), together with the island of Pelagosa, that was classified as a hamlet of the town of Lastovo. The allocation of Lagosta (and Cazza) to Italy was due to strategic reasons rather that ethnic, since it was the island of the archipelago with largest slavic population (unlike nearby Lissa, that instead went to Yugoslavia despite having a strong Italian community); indeed the centrality of Lagosta and Cazza in the Adriatic gave Italy a good strategic position to control it. The island's population, now completely Slavic, until WWII had a significant percentage of Italians. In fact, until the early 1920s the Dalmatian Italians were around 7% (families Martelletti, Sangaletti etc..) of the inhabitants. Some families emigrated to Lagosta after WWI from Lissa (now Vis), Curzola (now Korcula) and Lesina (now Hvar) because of these islands' assignment to Yugoslavia following the Treaty of Rapallo: the Italian census of 1921 counted 208 Italians in the 1,558 residents, or about 15%. But it is with the unofficial "census" of 1939 (based on the total of the 1936 official Italian census), that is more noticeable the wave of immigration: in fact, the population has grown to such an extent that it is not possible to attribute it to the simple natural balance. Indeed grew both Italian and croat components, but especially the italian which rised to 933 souls (38%), while the croat reached 1525 (62%), for a total of 2458 islanders. This means that in Lagosta, when the island was part of the Italian Province of Spalato in the Governorate of Dalmatia (between 1941 and 1943), more than 40% of the population was Italian-speaking (even because of the transfer to the island of fishermen from Puglia in 1940/41 in the village of San Pietro, today called Uble). Percentage which exceeded the 50% of the total, if considered the Italian military allocated in the island until 1943. Visiting the island, you can still see traces of twenty five years of Italian administration (theoretically Lagosta was Italian for almost thirty years since November 1918, when landed in the island some sailors of the Italian Royal Navy, until February 1947 when Italy gave officially the island to Tito). After the Second World War, the Treaty of Paris of 1947 assigned the island to the former Yugoslavia (with the croatian name "Lastovo") and is now part of Croatia. Currently there are no Italians in the island: all survivors of the massacres made by Tito -initiated in September 1943 with the execution of Italian governor Tomasin and continued even with the drowning in the sea between Ragusa and Lagosta with a millstone around the neck of Don Nicola Fantela, canon of the Diocese of Ragusa/Lagosta in October 1944 ( http://mortidimenticati.blogspot.com/2006_02_01_archive.html )- were forced to exile in 1947. The eradication of the Italians was started on September 14, 1943, when Tito occupied the island and immediately sent away the "regnicoli", as were called the Italians not born in Lagosta (http://ftp.casnigo.it/doc/il-paese/ lost ...). In the months following the Tito partizans killed many Italians of the island, executing someone even with false trials in 1944 that terrorized the whole small Italian community: the Italians of Lagosta were forced by these methods to exile almost completely before summer 1945. As an example we should remember Aurora Corsano, born in Lagosta, shot 1-3-1944 in the cemetery of Lagosta, after a fake trial. After the end of the war the few remaining were forced to leave in 1947, when the island was declared by Tito a "militarized territory" where only the Croats could remain. In addition we would like to remind once again that the Italian province of Zara between the two world wars was formed with the territory of Zara and also with the island of Lagosta. So we wonder when we will have in Lagosta something similar to what we have in Zara (now Zadar) as an "Italian organization" heir and/or result of that province? Perhaps a small branch of the Italian community of Zara (or even of Lesina) could be created in Lagosta? On the other hand there are many in Lagosta who have kinship (far away, but sometimes even close) with the 40% of the population of the island that was Italian in 1940, and someone -may be because of tourism- still speaks a little bit of "veneto da mar" (venetian dialect).... Furthermore a friend of mine, who has visited the island five years ago, argued that some of the actual inhabitants of Lagosta (now called Lastovo) would like to have in the island something like the Italian kindergarten "Pinocchio" of Zara, but bilingual Italian-Croatian (or Croatian but with courses in Italian). We must remember that in 1941 arose a village in Lagosta (now called Uble), in which many Italian fishermen had moved from Puglia: they created a small industry of fish conservation (destroyed later by Tito), but they even were making the Italian the most spoken language of the island. Indeed Lagosta in summer of 1943 enjoyed a certain economic well-being and had almost 3000 people (about half Italian speaking), while from 1945 in the hands of Tito's Yugoslavia the island has been depopulated and impoverished (now has less than eight hundred inhabitants, all Croats, and is considered one of the most poor and underdeveloped of the southern Dalmatian islands).